After being diagnosed with two bulging discs in her back just six weeks before IRONMAN Lake Tahoe last year, Heidi Miller, a 43-year-old mom, wasn’t sure she would be able to make the start line. Determined, she decided to try to finish her third IRONMAN event rather than not try at all. It’s no secret that cold weather conditions threw unexpected curveballs at last year’s inaugural Lake Tahoe competitors. After missing one of the bike cutoffs, officials pulled Miller from the course at mile 90, making the IRONMAN veteran doubt her ability to finish another race. “Not being able to continue the race after putting my life on hold to train really hurt me mentally,” says Miller. She adds that knowing her family made sacrifices too made the loss hurt even more. Still reeling with disappointment, Miller signed up for IRONMAN Texas in hopes of finding redemption along the way. Because of the self-doubt that loomed, Miller knew she wanted to make her IRONMAN Texas journey about something bigger than herself. “I wanted to insert more meaning into training and racing instead of embarking on another training cycle that, at times, felt self-absorbed,” says the Los Gatos, California resident. Miller knew that working for a greater good would motivate her through tough training and inevitable race-day pain, and so she signed up through the IRONMAN Foundation’s “Your Journey Your Cause” platform to raise money. Miller selected WINDY25, a non-profit founded by a friend from graduate school. The charity was born to preserve the memory of 16 victims from war in Afghanistan, while providing crucial recovery support to their families. (Currently, WINDY25 dedicates 100 percent of their funds to T.A.P.S., Tragedy Assistance Program for Survivors , which includes peer-based support, grief and trauma resources and retreats for surviving spouses and children.) Miller says that meeting several of the 16 families the month before IRONMAN Texas allowed her to attach faces to the cause, and, in her words, “brought a raw and emotional aspect to my mission.” That emotion furthered her determination “I wanted to work harder after meeting them, so that I could honor their grief and help support resources for people who may face a similar situation in the future,” she adds. 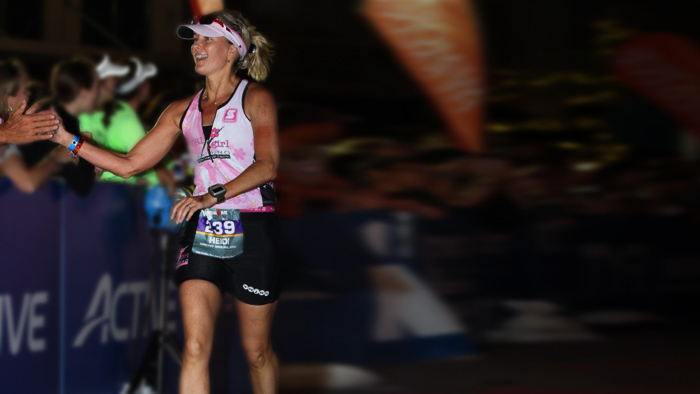 Not only did Miller up the ante for IRONMAN Texas by partnering with the IRONMAN Foundation, she also stayed true to her tradition of making race weekend a girls’ getaway. Just as she had done for her four previous IRONMAN races, she recruited two of her closest girlfriends to tackle the race along with her. Race day arrived and when the tiny voice of doubt reared its ugly head, Miller remembered the families she’d met . Specifically, it was a widowed mother of two young children who touched her heart and fueled her fight. “Knowing that my newfound friend was following me on race day motivated me to keep going when I wanted to stop,” she says. “I remembered that my race-day pain was temporary, while she was learning to live beyond the pain,” says Miller. With the help of stellar weather and a spot-on performance, Miller nabbed a 13:59:02, smashing her redemption mission and renewing belief in herself. She also raised $6,500 for WINDY25. And though she came in first out of her group of friends, she stuck around the finish line to absorb the atmosphere and relish their experience. “While I was over-the-moon excited with my own day, one of my girlfriends wasn’t as thrilled with hers,” Miller says. Having lived in the space of what-ifs herself, Miller immediately committed to racing IRONMAN Maryland to help support her friend’s own redemption mission. Go to IRONMAN.com to read more inspirational stories like this one. To make your miles count and learn more about the IRONMAN Foundation, visit ironmanfoundation.org.